June 22, 2018 at 12:26 am. 1. 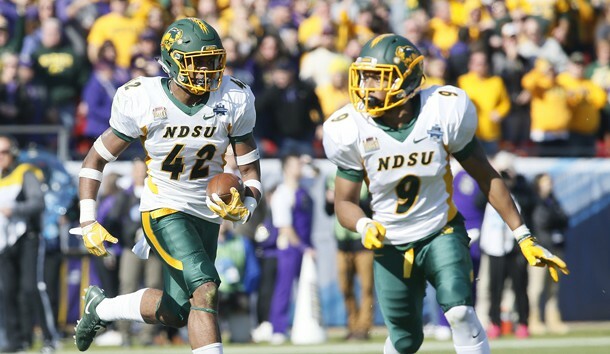 North Dakota State … Fourth national title for Chris Klieman would break tie with Craig Bohl for No. 1 at NDSU. 2. James Madison … Pitt transfer Ben DiNucci, holdover Cole Johnson, top candidates to replace QB Bryan Schor. 3. Sam Houston State … Transfer Mike Dare in line to replace two-time Payton Award-winning QB Jeremiah Briscoe. 4. Jacksonville State … Battle between Clemson transfer QB Zerrick Cooper, Zion Webb, worth watching. 5. South Dakota State … QB Taryn Christion (85 career TD passes) can extend Jackrabbits’ postseason streak to seven. 6. New Hampshire … Wildcats needed committee help to make 14th straight playoff trip, but 15th another safe bet. 7. Kennesaw State … Owls proved national legitimacy by knocking out Jacksonville State, reaching FCS quarters. 8. Weber State … Wildcats reached FCS quarterfinals, but coach Jay Hill must replace QB Stefan Cantwell. 9. Eastern Washington … Eagles seek better than playoff-less ‘17 that included QB Gage Gubrud’s 1-game suspension. 10. Wofford … Legendary Mike Ayers retired after 30 years, 207 wins; ex-Pitt DC Josh Conklin takes over. 11. Central Arkansas … UCA is 24-3 in Southland since ‘15, but lost QB Hayden Hildenbrand, HC Steve Campbell. 12. Idaho …Vandals back in Big Sky, FCS for first time since 1995; Mason Petrino a QB candidate. 13. Samford … Bulldogs have talent, but program that last won playoff game in 1991 must clear that hurdle. 14. UNI … Rickey Neal, the Missouri Valley’s leader in sacks, will look to return Panthers to the playoffs. 15. Austin Peay … Govs a playoff snub after losing to three FBS opponents; Georgia lone FBS foe on ‘18 slate. 16. Nicholls … Colonels have never made back-to-back playoff appearances, but return nearly everyone. 17. Furman … Clay Hendrix led Paladins to playoffs in year one; squad was 0-2 vs. Wofford though. 18. Yale … Bulldogs won first outright Ivy League title since 1980, and team’s biggest stars are back. 19. North Carolina A&T … Aggies, 40-8 since ‘14, return QB Lamar Raynard, but will miss retired coach Rod Broadway. 20. San Diego … After winning playoff games in each of the past two seasons, Toreros are building respect. 21. Elon … Curt Cignetti was CAA Coach of the Year after playoff trip in first year with Phoenix. 22. Youngstown State … Bo Pelini and Co. fell to 6-5 after national title game appearance, but young team earned reps.
23. Montana … As second Bobby Hauck era begins, ex-UNLV starter Dalton Sneed looks like the QB. 24. Lehigh … RB Dominick Bragalone (22 TD), QB Brad Mayes (31 TD, 12 INT) lead Patriot champs. 25. Northern Arizona … Lumberjacks (7-5) finished 2017 with a whimper, but QB Case Cookus offers hope.